Imagine you’re in the wilderness with nothing but yourself or a bunch of friends who don’t know anything about enduring in the wild lands. Now their salvation lies in your hands; that is if you know how to survive in the first place. Good thing you’ve come to our page. In this article, I will teach you how to make a crossbow from scratch. When you’re able to craft one, being in the wilderness will become a great adventure! Having a crossbow means multiple benefits. This weapon has a lot of applications mainly hunting for food or an effective defense against possible predators. So the next time a small boar appears nearby, you just have to aim and fire the crossbow, and if you’re lucky enough, you’ll be having a nice dinner later. Well, at least you have something to eat. Furthermore, a crossbow is also an effective weapon as you can use it against dangerous animals that seek to harm you. 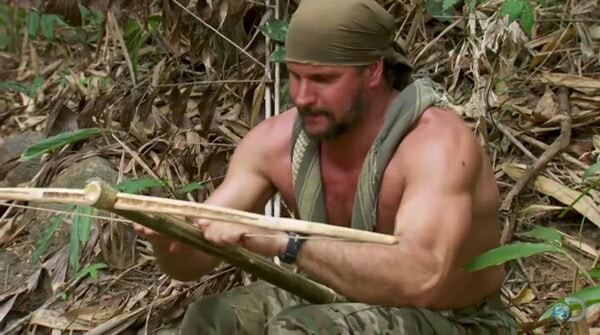 Creating a crossbow is not just for real life-and-death situations as you can build one just for fun! For instance, you can make this weapon while camping with your friends. That way, you’ll be able to have exciting memories together while hunting for food which you will grill later at night. Just be careful enough not to hit any of your allies because crossbows are still dangerous even if you make it for fun. You should also be cautious enough not to hurt endangered animals. The real challenge here is making this weapon without anything but with the help of nature itself – this means all materials used must be resourced from your surroundings. However, you might need a real knife in making this thing. Otherwise, you have to make your own blade. It’s also a form of motivation if ever you’re facing a real scenario – that it’s possible to make a tool for survival with nothing but a few things in your backpack and materials from nature. Now it’s time to do the real deal! Every crossbow only has four main elements: the body, limb, string, and the trigger. 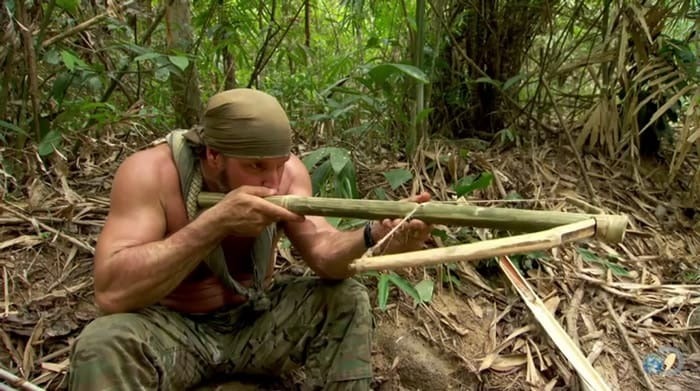 In this article, we will deal with making an indigenous crossbow out of bamboo. This giant woody grass (yes it’s a grass though it doesn’t look like one) is quite common to the wilderness especially in the tropics so you won’t have a hard time finding one. The first thing you have to do is to search for a bamboo. This is a green woody grass with perfect properties suitable to be made into a great crossbow – robust and flexible. Most people only come to know how a small or “baby bamboo” looks like and not the big one. Baby bamboos are common to landscaping and garden aesthetics. But take note that this is NOT the bamboo you are looking for. You will need to find its grown-up counterpart. Bamboos can be as high as a two-story building, so it’s important you know how it appears. Don’t worry. You can easily recognize a bamboo if you know how it looks like. It is composed of multiple stems having green color unlike most plants and trees (that only have a single, brown stem) making it distinct in the wilderness. 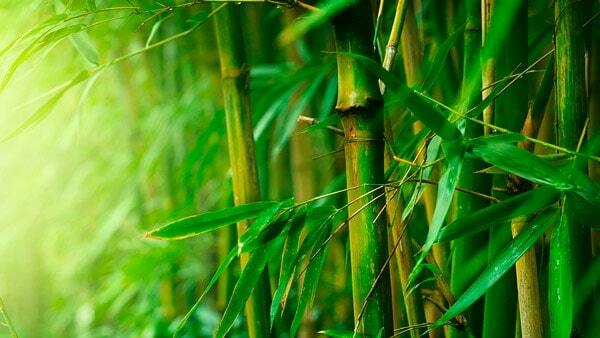 A bamboo also has vascular bundles located in the cross section and are distributed in the whole length of the steam. Bamboos are columnar rather than tapering. This is caused by the absence of secondary growth wood. Now you know how a bamboo looks like; you won’t have a hard time finding one. If ever you’re hesitant, you can cut the cross-sectional part of the stem which you believed is a bamboo and see through it. If it’s hollow, then it’s a bamboo. A good tip: The big bamboo actually looks like the baby bamboo you have come to know, only that it’s way bigger and grown. Find a bamboo with a stem diameter of about an inch. You don’t need the massive ones but rather just the small sized. Now cut three stems, each having a meter in length. You won’t be needing all of these but the extra ones are your reserves. 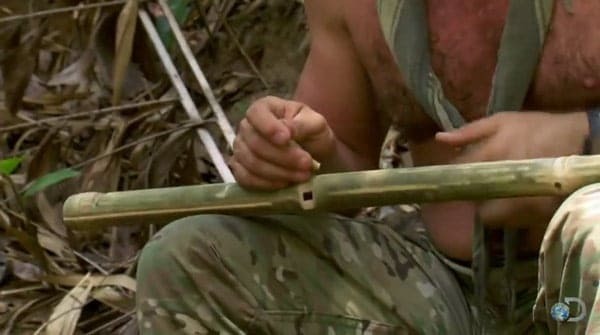 For your crossbow’s body, one bamboo stem with 1m length is enough. For the limb, get another 1m bamboo stem and cut through its diameter. Now bend it using your hands and knees as support. The outer part of the stem must be the one in contact with your knees and not the other way around. Also, be careful not to put too much stress to the extent that it breaks. Step 4. Cut a hole in the body. Make a hole about 1.5 inches from the end part of the body. The holes must be made all throughout and with a size enough to fit the limb you’ve done just previously. Now this step is a little technical. The trigger is a small piece of wood in the shape of capital “T”. The vertical part must be about 2inches, and the horizontal part must be about 1inch. Along with that, you must also make a square hole through the center of the body. This is where you’ll put the trigger. You can create a natural cordage strings out of fibrous plants. Good examples include stingy nettle, Dogbane, and Cedar bark. Strong natural cordage can be made by twisting fibers using two-ply twist method. Using this technique, make your own natural cordage with a certain length that bridges the gap between the two ends of your bent limb. You can just make some estimates because obviously there would be no ruler lying around in the wilderness. 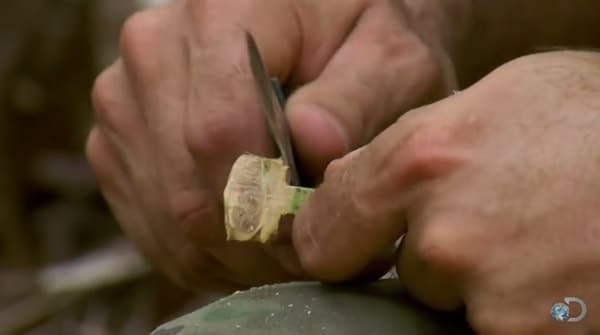 Just make sure that the cordage (when tied to both ends of the limb) can be stretched to the point where you made the square hole in such a way that the limb bends significantly when you pull it. 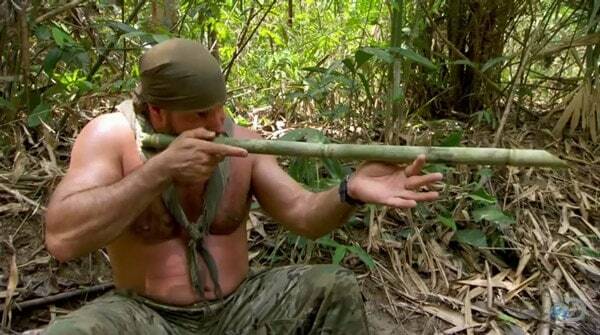 So when you release the trigger, the arrow will have a powerful thrust. 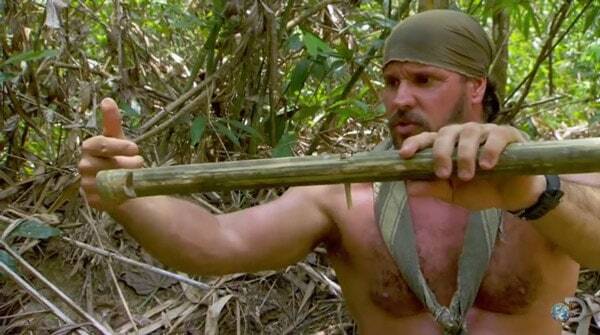 Now tie the cordage to the limb and try stretching it to the trigger point. Then try releasing it. If you could feel there’s a powerful pull after you have released it, then you have made a good crossbow. 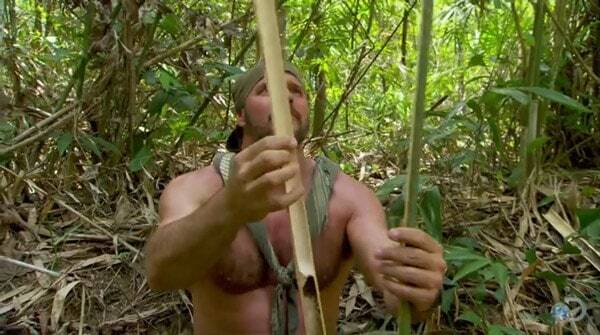 Now all you need is an arrow. You can try searching for other tutorials online or watch out for my next article! There you have it! 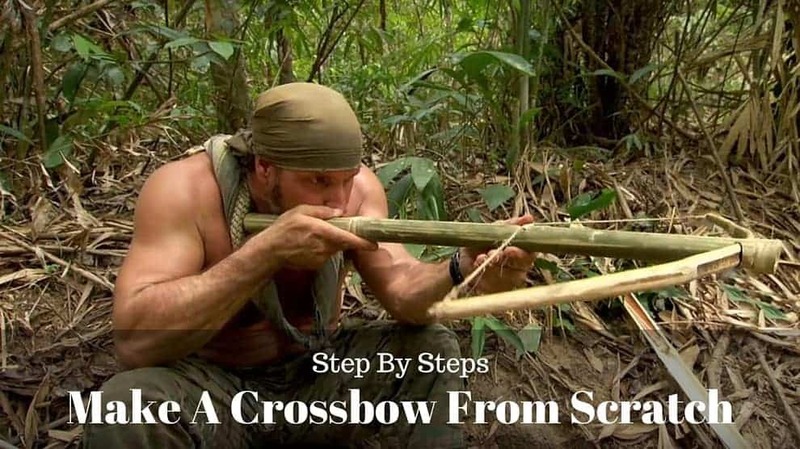 Remember these steps whenever there’s a need to make a crossbow. You can also do this at home as a form of practice should you experience a real-life survival situation.